Part academia, part history, part theory, part commentary and part mystery itself, this ambitious book tackles numerous subjects at once. Not because the author lost his focus, but because the stories, and the people in them, were so intertwined. The character Charlie Chan was “invented” by American writer Earl Derr Biggers. Yet Chan was inspired by real-life Honolulu detective Chang Apana. Apana was illiterate and spoke only broken English but was an amazing officer and caught dozens of criminals in his lengthy career. A bit of a legend in his own time (stories circulated about his abilities with a bullwhip), Biggers got the idea for a Chinese detective. The books were wildly popular, and prompted several films (some not even based on books written by Biggers). All of this amid American anti-immigration policies and before Hawaii was even a state. Huang ably describes the circumstances in which this character was born and how he rose to fame. Aspects of Orientalism, the Great Depression, popular Hollywood, and literary prowess are all investigated. By setting the contexts for Chan’s popularity, Huang gives perspective to what might seem like an outmoded and, by some, racist character. In fact, Huang tackles this dialogue head-on and dissipates the rhetoric without insulting the angry critics. Rather, he exposes how very complex Chan really is — and the reception he has received in other countries, including China. Less focus is given to Biggers and his creation of the character than I would have liked, but only inasmuch as that is where my curiosity lies. While the films inspired by Chan are of varying degrees of quality, the books are solid and show significant research on Biggers’ part. Having read most of Biggers’ novels, I was surprised to find how literary they were, having been introduced to Chan by Warner Oland. 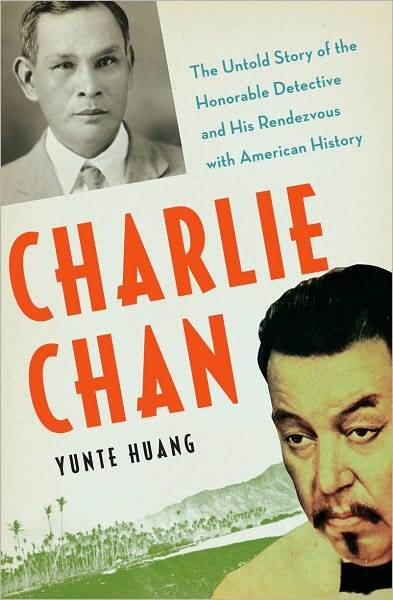 Huang does credit to a number of artists who helped to shape Charlie Chan. And he graciously allows for an enjoyment of Chan, particularly the films, that is not insensitive. Thankfully, in researching and putting together this book, Yunte Huang took a bit of Charlie’s own advice: Mind like parachute – only function when open! Thanks to the folks at WW Norton for the review copy.